Pilot House Distilling, co-founded by Larry Cary in 2013, is being acquired by Buoy Beer Co.
Justin Cross, an employee of Buoy Beer Co., helps bottle absinthe at Pilot House Distilling. Cary will still run distillery operations, while Buoy Beer will provide capital and administrative support to help him grow. His wife, Christina, helps operate Pilot House. The two still own a related but separate company, Grumpy Dog Shrub Co., making drinking vinegars and other mixers. While Buoy Beer has experienced a lot of growth, the craft beer scene is getting tighter, with more than 6,000 breweries nationwide, Kroening said. “Craft breweries are starting to come up against it a little bit, just like the megabreweries have been for the last few years,” he said. “As that kind of settles out and we see where that goes, this is kind of a growing industry, and we have local people we can work with. 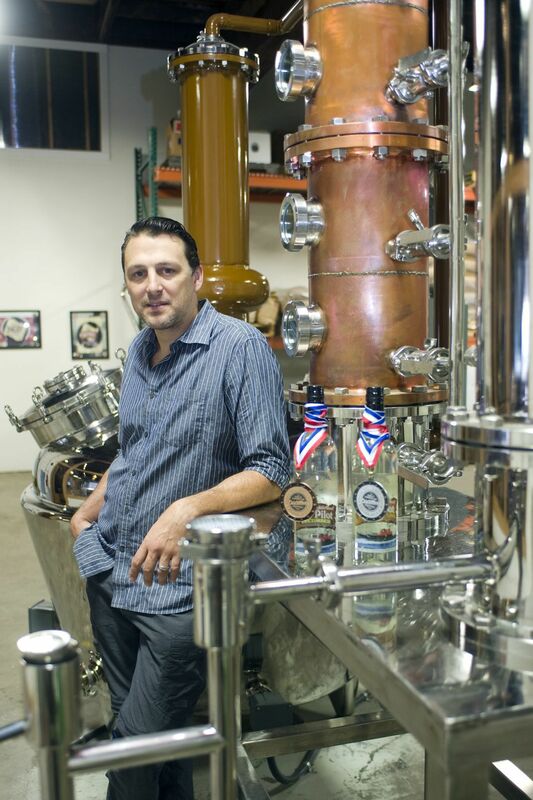 Cary, a former billiards salesman, started Pilot House with Shelton in 2013 as North Coast Distilling in the Astoria Plumbing building on Duane Street. The distillery has grown, winning national awards and becoming one of the first to release cocktails in a can. “My biggest obstacle the last couple of years has been keeping up with demand we’ve created,” Cary said. Since opening, Cary has also run into legal hurdles, namely trademark disputes. North Coast Brewing Co., from California, threatened to sue over the similarity of the distillery’s original name, leading Cary to rename the company Pilot House Spirits. House Spirits Distillery in Portland soon made a similar threat, leading to another name change to Pilot House Distilling. Cary said the craft distilling industry has also been challenged by a draconian state tax system. Distillers pay up to 40 percent of tasting room bottle sales to the state. Gov. Kate Brown’s budget proposal calls for a 5 percent tax hike to raise another $21 million in revenue. “It makes it very hard for small distilleries to break out of that small mold and grow,” he said. The high taxes and administrative requirements have made it difficult to add employees, Cary said. Buoy Beer recently provided help to bottle spirits, along with mash from its brewhouse, to enable Cary to turn out more whiskey. Cary is excited about being able to keep up with demand and put out some new varieties of liquor and canned cocktails, which now include a bloody mary, Moscow Mule and a gin and tonic. The process of transferring licenses has been delayed by the partial government shutdown, but the two sides hope to complete the changeover by the summer. In the meantime, the brewers at Buoy will focus on making good beer, while Cary will have the freedom to focus on making good spirits, Kroening said. “Everybody’s focusing on what their passions are and what they’re great at,” he said.